You’re spending lots of time marketing your business but getting little to no clients. And you’re struggling to attract clients on social media or your website. Know Your Ideal Client is a self study course that give you the key to your effective marketing. Knowing your audience is one of the most powerful keys to your business success. Discover exactly who your clients are and how you can reach them. Create marketing that attracts clients like clockwork. Get the steps you need and all the know how to accompany your workbooks to identify your target market. 7 workbooks full of fab questions and exercises to help you create your compelling marketing message, identify your ideal target market and insight into what your target market truly want so you can meet their needs. For only £24.99 this could be what makes all the difference to your business. Knowing your ideal client and niche and what to say to them and where to say it makes a HUGE difference to how successful your marketing is. 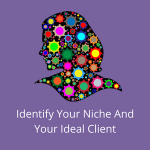 This training video and workbooks takes you through the steps to take to know your niche and your ideal client. I’ve struggled with defining my niche for months and your course worked for me. Thank you. Since I've done ‘Your Ideal Client’ course with you my web visitors have gone up by 300%!